At KitePassion Tarifa Kiteschool we make sure that you learn kiteboarding and enjoy this amazing sport with the same passion as we do. Our goal is to teach you in a safe and the most enjoyable manner. We have more than 10 years of experience teaching kitesurf, surf and SUP to kids and adults of all levels. Our certified instructors (Level 2 IKO – International Kiteboarding Organisation and FAV) can teach you from the basics until the improvement courses. All our courses include insurance, IKO card (course certificate) and IKO Level 2 instructors. KitePassion Tarifa guarantees your progress, your fun and your safety. Always with the best quality/price ratio in Tarifa! BEST WAY TO TRY KITESURFING! Do you want to try this sport but you are not sure if you will enjoy? Try it just for one day and decide later! 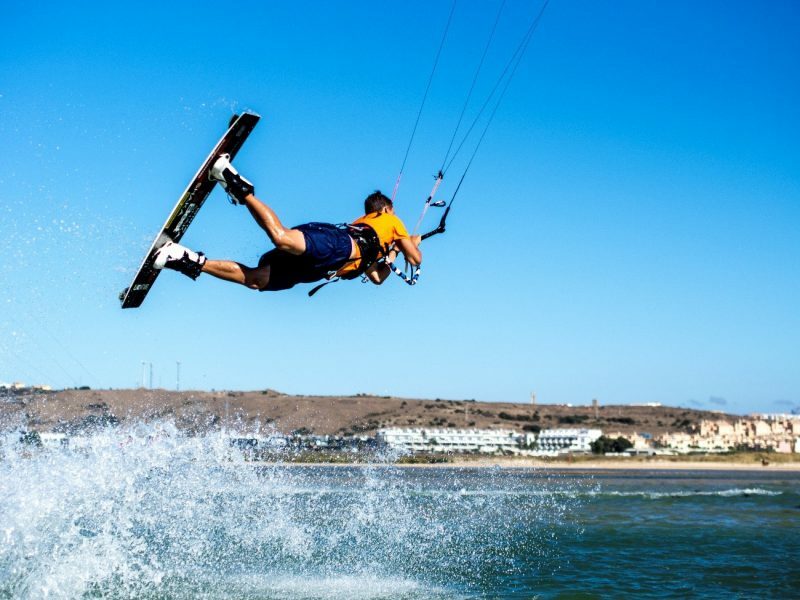 At KitePassion Tarifa we are sure that you’ll get hooked on this spectacular sport. This kitesurf course takes 3 hours in a group of 2-4 people. We teach you everything about security systems, setting up and flying the kite. At the end of the lesson, you will be 100% ready to go directly to the water! 2 days course: 6 hours for only €140 per person. 3 days course: 9 hours for only €195 per person. 4 days course: 12 hours for only €260 per person. Best quality/price ratio in Tarifa. Are you coming to Tarifa with someone and you always want to have a kite? If so, then this is your best kitesurf course: 2 kites, 2 students, 1 instructor and nothing that could slow your kiteboarding progress. All attention of the instructor only for you and your course partner while you fly two kites! You will learn from zero and you will finish your course being an independent rider. 1 kite, 1 instructor and YOU. Everything at your disposal to learn this sport with the guaranteed success! All courses include a complete Eleveight Kites equipment, insurances, rescue boats, IKO Level 2 instructor and IKO card. Are you looking for an accommodation in Tarifa? Click here for info about our kitesurf lessons and accommodation packages. I had a couple of lessons with KitePassion and I am very happy with the result. They gave me the tips on waterstart and going upwind that I needed. Now I can ride the kite on my own. Thanks Juan! I could not ask for a better place to learn kite. KitePassion school does every single thing in the highest level possible, so we as customers will finish the course as satisfied as possible. Top quality equipment and amazing instructors with lots of knowledge, patience, and with a smile on their face non stop!